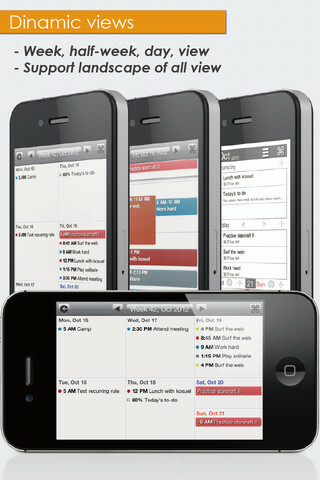 When it comes building an iPhone calendar app, you are generally limited to the functions of the built-in iOS calendar itself. So to be successful on the App Store, a developer must go the extra mile to present all the same information in not only a more appealing manner, but also make their app multifunctional to include other features. 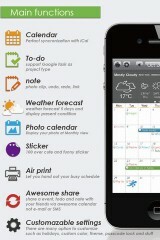 That is exactly what the developers of Awesome Calendar have done. Awesome Calendar sells itself on it’s unique calendar views, integration with Google Task & Google Diary, and numerous additional features that go way beyond what the built-in iPhone calendar can do. When you open Awesome Calendar, the first thing you will notice is that its completely different than the built-in calendar. They both start with the monthly calendar, but instead of listing events per day below it, Awesome Calendar puts every event inside the calendar. The app actually places the first 6 letters of the first 3 events to occur that day in the tiny rectangles (representing days). I personally love this feature, but I can see those with eye sight issues having a difficulty time reading it. Just be warned. You can quickly see all events for that day in larger print (i.e. expanded) by tapping once on a calendar day. You also have the option of seeing a weekly view of your events from the popup, which actually is quite appealing. I can see many users wanting to use this app just for that feature. The closest the built-in iOS calendar gets to that is a list view, but it has nothing on this superbly designed weekly view. 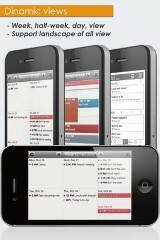 Awesome Calendar also has a list view itself for those of you who are interested. Another feature that will probably catch your eye immediately is the nicely designed weather forecast above your calendar. This was a smart move by the developers, because many jobs are in some way affected by the weather outside and even if there not, everybody has to get dressed in the morning for work. You also might be intrigued by the icon badge options, which can either show the day number or the the number of events, to-dos, or both combined. Given that the default iPhone calendar includes the day number on the app icon itself, you won’t actually lose that if you make the switch permanently. An interesting addition to this app is a useful photo calendar that shows when your photos have been taken on a calendar. I can see users that utilize the photography element of the phone (more than I do at least) liking this feature a lot. The developers also included a ton of extras and customizations, with everything from unique stickers, to embedded holidays, syncing with Google Diary & Tasks, and different theme colors. I personally love the “fade out” feature which fades out an event on the monthly calendar after it happens. Very helpful! Awesome Calendar is an exceptional alternative to the native iPhone calendar, adding a ton of features and displaying events in a more useful way. Though Awesome Calendar is a bit pricey, you are indeed getting an app that can completely replace the default calendar by doing everything it does but much more.